Looking back on my blog post from last year sharing my 10 Twitter Tips for Law Firms, I realise that number 1 on the list was ‘Create at least two Twitter accounts’. Moving further into 2012, there are many more sector-specific Twitter accounts and indeed lawyers having their own Twitter accounts separate from the main law firm account (known as the ‘battleships’ and ‘destroyers’, terms and principles first coined by Jon Bloor and developed and embraced by Brian Inkster and other law firms such as Biggart Baillie). As an avid Twitter user, it’s great to see such a savvy approach from lawyers and legal marketers. They are realising that if they have just one account that bombards its followers with many different types of legal information or news and has conversations with many different types of contacts, they are perhaps going to lose followers or, to put it more accurately, they are not going to gain as many relevant followers as they would have liked. The same applies for blogging to some extent. If you have a blog that isn’t focused enough and delivers a broad range of content, it will not do as well as the blog that is more focused with content that its readers and subscribers can expect to read. This shouldn’t be a problem for the larger law firms especially those with their own IT teams: they will most likely have many email addresses with which to create multiple accounts. The problem may arise for those law firms that have fewer lawyers (or at least fewer lawyers interested in connecting using social media) or for law firms that don’t have IT teams readily available to set them up with more, relevant email addresses. I used to suffer from a similar problem because I used a new Gmail email address for every Twitter account I created. This wasn’t a problem for the first few Twitter accounts. But Gmail requires you to authenticate every new Gmail address with a mobile phone number and you can only authenticate so many email addresses using the one phone number [edit at 12 March: it appears that while SMS authentication was previously required to set up multiple Gmail accounts, it doesn’t appear to be required any more. Thanks to John Storer for clarifying this]. I soon (very soon) got frustrated with setting up new gmail accounts for each Twitter account I created, either for myself or for my colleagues. I found an easier method of setting up multiple Twitter accounts using just one gmail address through The Social Media Guide and I thought it would be useful to show you how to do this. Thereafter, enter a new email address in the ‘To’ box, which should take the form of your Gmail username with the plus symbol ‘+’ followed by a new email address filter. 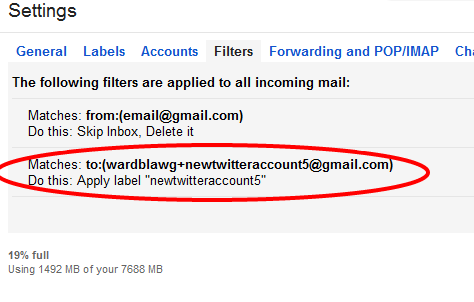 For example, wardblawg+newtwitteraccount5@gmail.com as below. The new filter name is not important, so long as you can remember it. 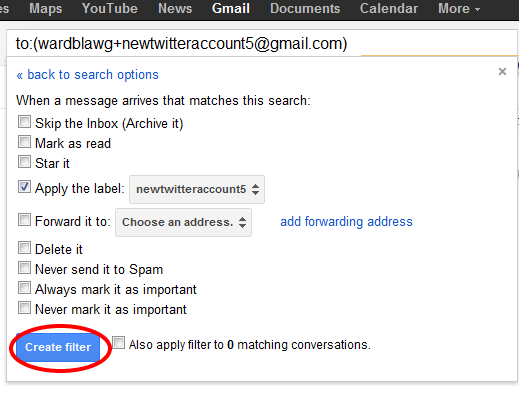 After you’ve done that, click ‘create filter with this search’ and click ‘discard’ if it says changes have not been saved. Then click on the ‘Apply the label’ option and ‘Choose Label’. Select ‘New Label’ from the drop down list’. Once in this screen enter the label name again and click create. For instance, in my case I’ve entered ‘newtwitteraccount5’. Once you’ve set up this filter, go back to twitter.com, having logged out of any of your other accounts, and click ‘sign up‘. 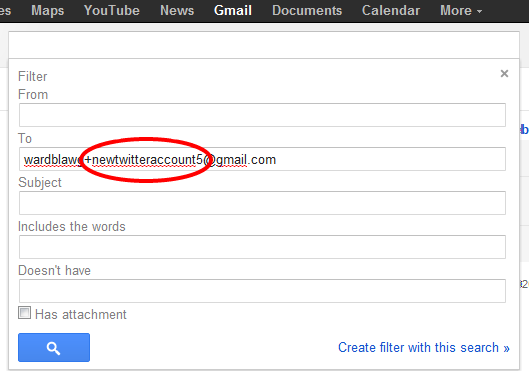 You can then apply for your new username using your new email address filter e.g. in my case, I’d enter wardblawg+newtwitteraccount5@gmail.com. There should now be a green tick and a message saying ‘we will email you a confirmation’. Once you’ve entered all your other details click ‘create my account’. 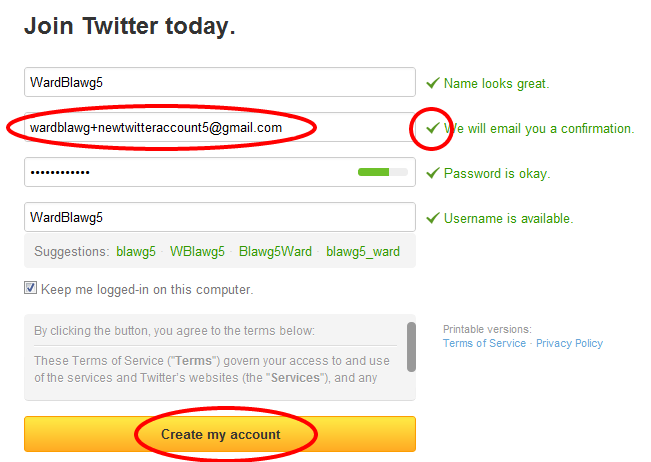 Once you’ve clicked ‘create my account’, Twitter will automatically send a confirmation email to your new email filter. 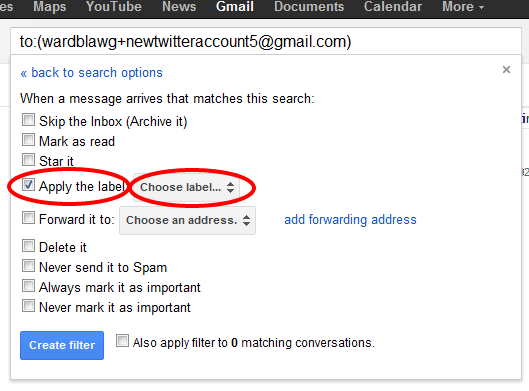 If you go back to your gmail account and click the filter option from the left-hand side of the screen, you will find that the Twitter confirmation email is sitting in that new inbox. Click confirm and that’s you done. As you will see, another advantage of this is that you have now created a separate filter into which all notifications from your new Twitter account can go. 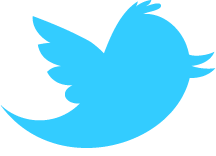 PS don’t forget to check out my 10 Twitter Tips for Law Firms post if you haven’t done so already or get in touch with me at Moore Legal Technology to discuss social media for lawyers in more detail. Addendum at 14 March 2012: Do bear in mind that if you are setting up multiple accounts, ensure you use these for legitimate social media use and within Twitter’s rules. Under The Twitter Rules, under the ‘Serial Accounts’ section, Twitter notes that “You may not create serial accounts for disruptive or abusive purposes, or with overlapping use cases. Mass account creation may result in suspension of all related accounts. Please note that any violation of the Twitter Rules is cause for permanent suspension of all accounts.” That aside, again, happy tweeting! Of course these days most law firms will have their own internet domain; any firm that does not has more urgent issues to deal with than multiple social media accounts. Even if you are not hosting you own email server (which will generally need an IT guy or team), you will likely have email to your domain (e.g. hosted by your ISP). Therefore the same principles of using the Gmail accounts apply to using your own domain: just open up a new email address on your domain the same as if it were for a new member of staff, except instead of a personal name use a department name, like “taxplanning@examplelawfirm.co.uk”. The other advantage of that (especially compared with using Gmail) is that this “department” address can also be used for people to contact the firm for a particular service. So the above example could be publicised for anyone wanting tax planning advice to send requests to; that address would be monitored by someone (who need not be a solicitor) and requests forwarded to the relevant person/department. Likewise an address might not be publicised, but only given out to appropriate persons: for example an address for correspondent firms to send court instructions (which can be constantly monitored by multiple staff to ensure immediate action), or for established clients who need particular services, to give them a “direct line” method of giving instructions. Maybe this advice is best suited for micro businesses as HighlandLawyer suggests. Another way smaller firms can have multiple accounts is to have a hosting account with someone like 1and1 for a few dollars a month and set up POP3 accounts on there easily enough. I have a load of email addresses on several domains witht hem and many are redirected to one POP3 or IMAP account. Pretty easy to manage and set up and pretty powerful in terms of management options. looks like Twitter no longer accepts email addresses created this way. I tried today and unfortunately wasn’t able to create another account using an address with a filter name. I’ve got ”this is not a valid address” message. What a shame. I think Twitter could finally understand that for some people having multiple accounts does make sense and stop making it such a pain in the neck to create them with a single email address.